This might be record breaking time for me in getting from the dinner table to my blog. In the course of an unprecedented calm, collected and easy Sunday afternoon of cooking, I realized this salad was too good not to share right away - I'm actually writing this all in the same day! But because the baby is fast asleep and I'm not entirely convinced my luck won't run out soon, I'm going to keep it really short and sweet. It's a simple salad, and simple instructions will do. 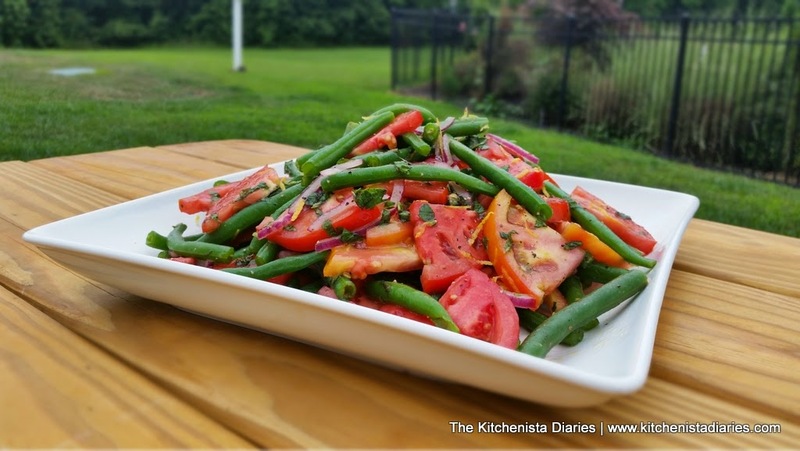 You'll notice in the title that I called this my "Summer" Tomato & Green Bean Salad. This is one of those seasonal dishes that will pale in comparison to the real thing if you try to make it in the dead of winter with lackluster tomatoes and flash frozen green beans. 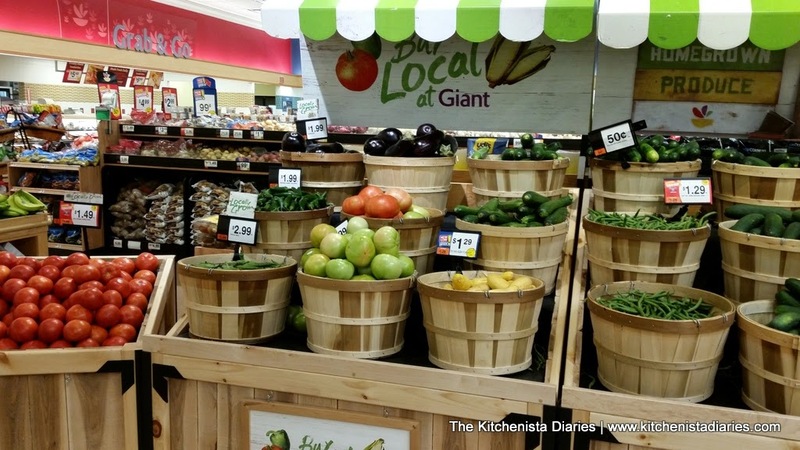 Produce is ridiculously amazing right now, so do yourself a favor and savor some fresh, local ingredients while summer is still here! 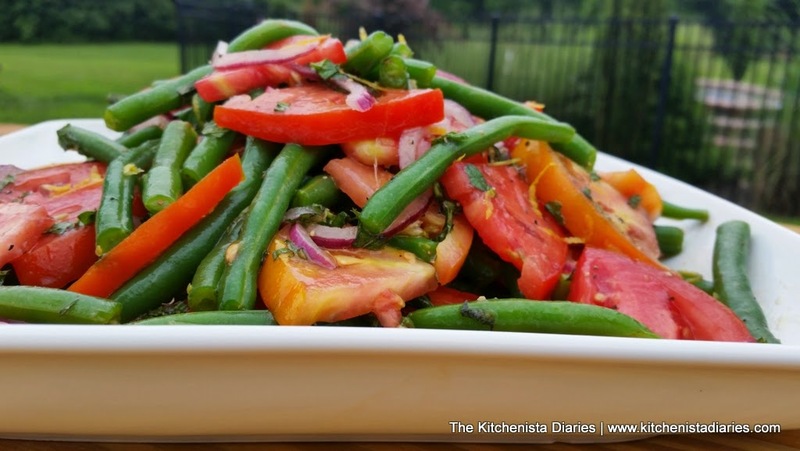 The green beans will need to be blanched first so that they are tender enough to eat in the salad. 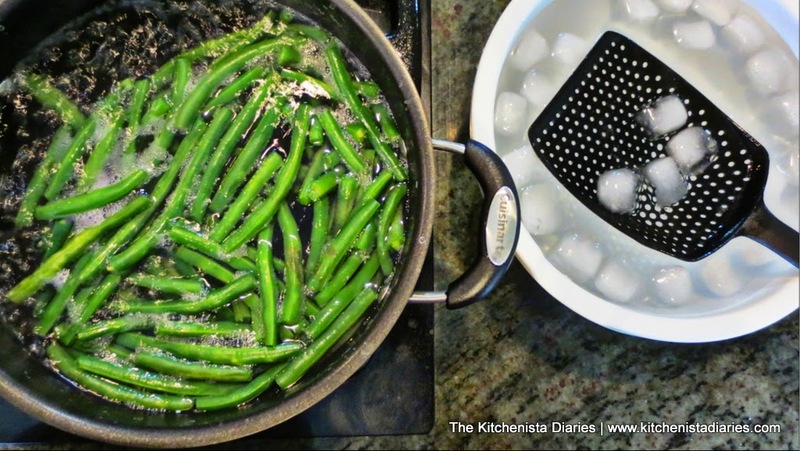 Get a pot of salted boiling water ready while you trim the green beans. The water should be salty enough that you can taste it; a few tablespoons usually does it for a couple quarts of water. You can use sea salt or kosher salt. When you're ready to add the green beans to boiling water, have a bowl of salted ice water ready nearby. This is a tip I picked up from watching Anne Burrell cook, and what a difference that makes for flavor. I've always cold-shocked my blanched veggies but never thought to salt that water too. Allow the green beans to blanch for a few minutes or until they are crisp tender (best way to check is to taste one!) Using a slotted spoon, transfer to the salted ice water bath. This will stop the cooking process and preserve the bright green color of the green beans. After green beans have cooled completely, you can drain the water and leave them in the mixing bowl. Gather all other ingredients. For the fresh herbs, it's really up to you - fresh oregano, basil and mint all work really well here. 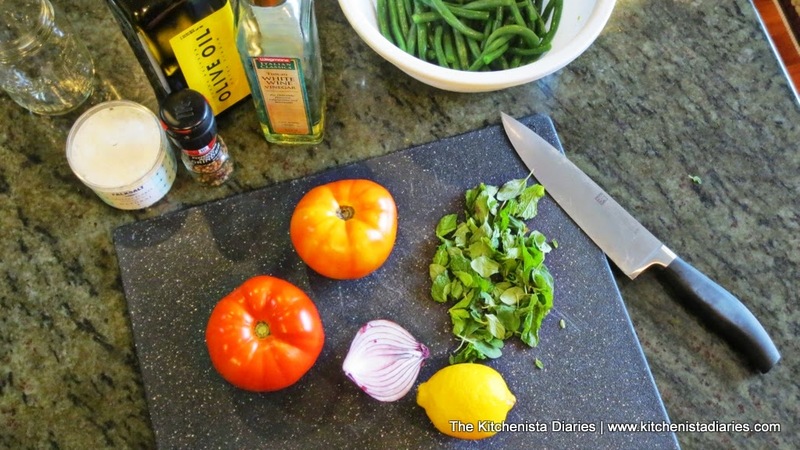 In the summer I tend to have a ton of herbs on hand, so I choose to use mint and oregano today! 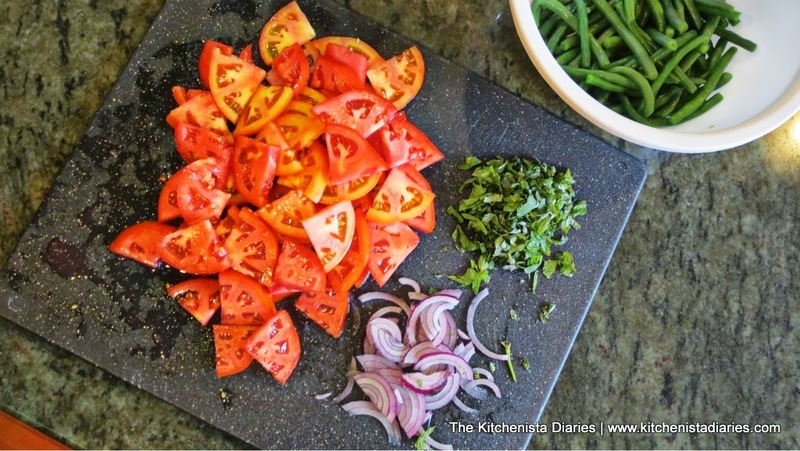 Roughly chop the herbs, core and slice the tomato and thinly slice your red onion. Tomatoes are gorgeous in the summer. I love the variety of shades from green-tinged yellow all the way to the vivid reds. 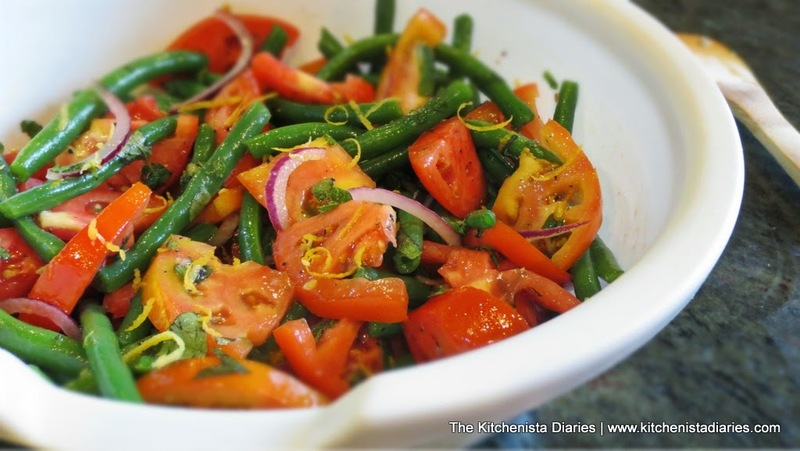 Gently toss together the blanched green beans, tomato slices, onion and fresh herbs with lemon zest, a healthy amount of sea salt and plenty of cracked black pepper. I used about a tablespoon of flaked sea salt, but that amount will vary for you depending on the salt used, your taste, and the flavor of your veggies. 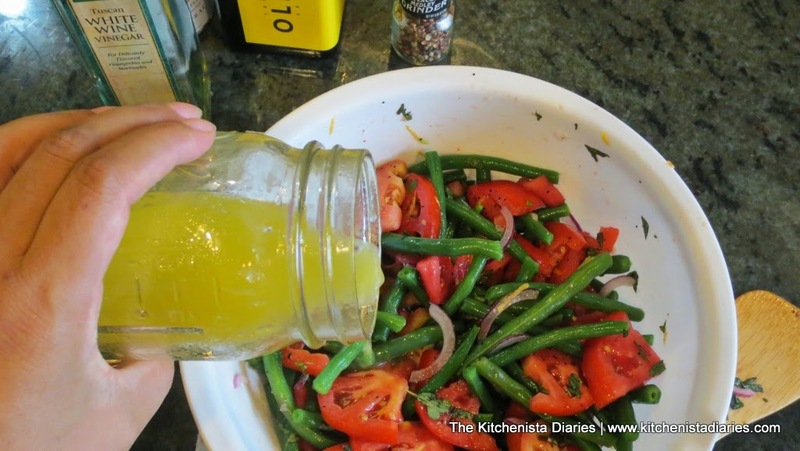 In a mason jar or small bowl, shake (or whisk) together the vinegar, olive oil, and a few teaspoons of lemon juice. 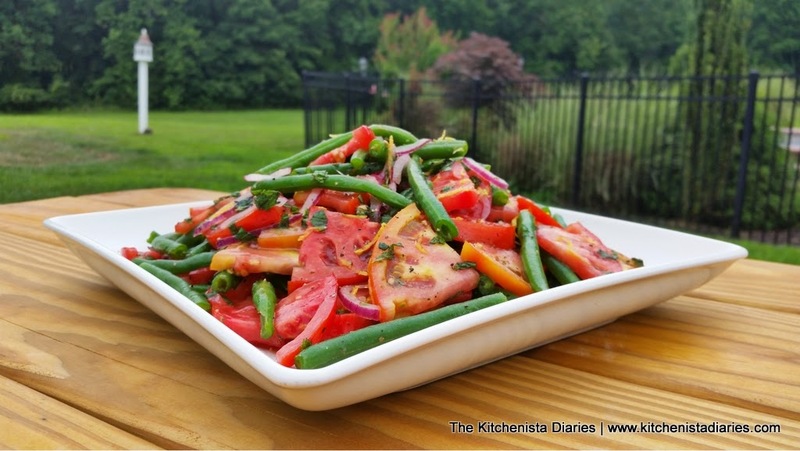 Pour it over the salad and toss to coat the tomatoes and green beans. Taste test for seasoning, adjusting salt & pepper as needed. Allow the salad to chill in the fridge for an hour before serving; this will give it plenty of time to marinate and flavors to develop. 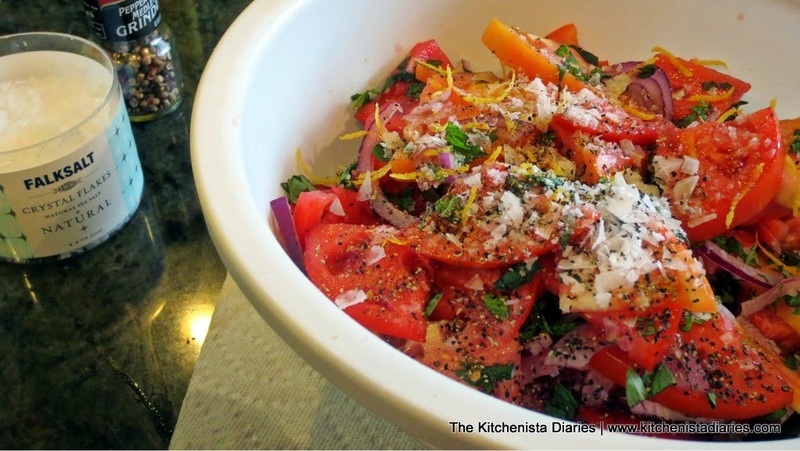 As the salt will draw out lots of liquid from the tomatoes, it's best to leave the salad in the bowl and then transfer to your serving dish (if you're using a different one) just before serving. This is summer on a plate...enjoy!